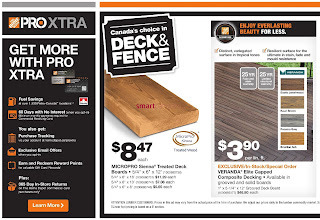 Home depot pro xtra savings, Get more with Pro Xtra Fuel Savings (at over 1.500 Petro-Canada Locations) 60 Days with No Interest (Ehen you opt-in minimum monthly payments required for commercial Revolving card), You also get : Purchase tracking (Via your account at homedepot.ca/proxtra), Exclusive Email Offers (When you opt-in), Earn and Redeem reward Points (For valuable gift card rewards), Plus: 365 day in-store returns on the home depot commercial card purchase only. Enjoy everlasting beauty for less. Distinct, variegated surface in tropical tones, Resilent surface for the ultimate in stain, fade and mould resistance. 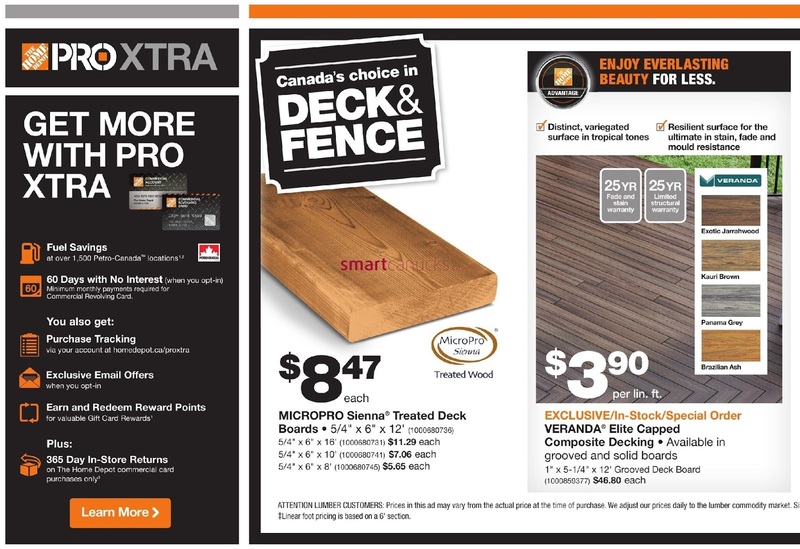 Exclusive / In-Stock / Special Order Veranda elite capped composite decking, available in grooved and solid boards price now $3.90 per lin. ft.